So…I don’t know how it got to be so long since I last posted. I kept wanting to and started and then something would come up that needed my attention. And then here we are. Sooooo much is going on that I get overwhelmed trying to decide what to tell you all so I suppose I should simply start somewhere. Anywhere. This year has been an odd year for us and the bees! In April we thought the honey production was pretty much done and we were really a little blue about it. But then we took a trip to Florida to see family and when we got home, it became the beginning of on and off rainy spell that has continued until now. Amazing what a week can change. 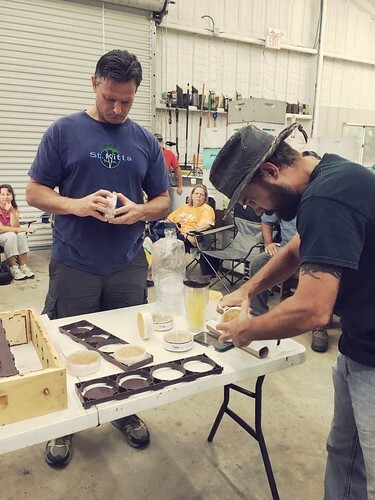 We went from worrying about how to make the little bit of honey stretch all year to having to wait and wait and wait while the bees continue to make honey. Great change in plan. 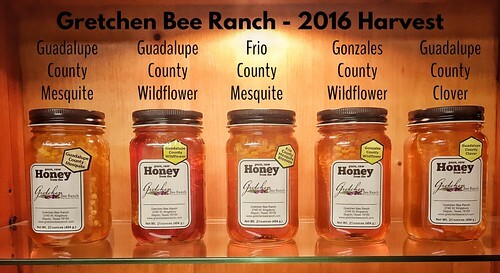 We pulled honey supers twice now from our two farthest bee yards! The second round (just yesterday) yielded 42 supers and we could not be happier with our bees in Comanche Creek and Bigfoot. Good job girls! 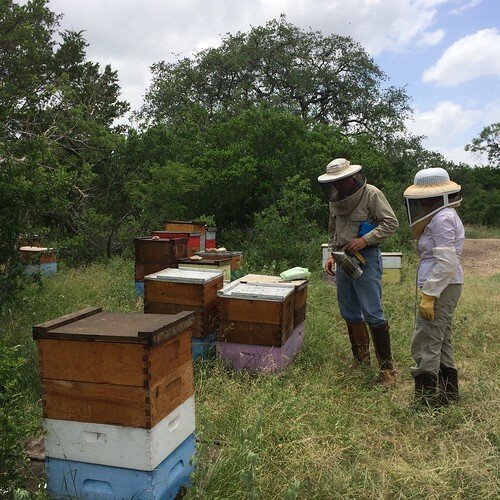 Here’s a shot of Mark and my sister Thuy last week at Comanche Creek bee yard in Medina County. Those are the second round supers on the hives. We had gone out there to see how they were doing. We also measured moisture levels to confirm they supers were ready to pull. During the past several weeks, we’ve also had a big development in our Pearl Farmers Market life. 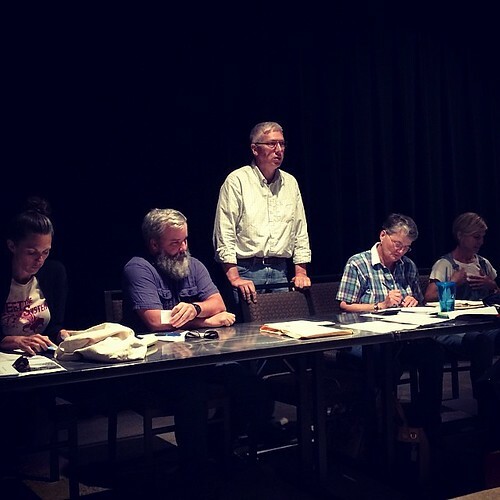 Mark was elected President of the Board of Directors for the market association and I will continue in my support role of Communications Liaison between the Board and association members. We have a lot to learn but we are excited to have a chance to be more involved with the continued growth and development of the market. Can’t wait to see what the future holds for us all there at the Pearl. What a lovely place to be! We are close to having permanent home for the market. Once the Pearl completes construction of the Hotel Emma and neighboring structure, the market will finally have a home we can grow into. Exciting! We continue to meet some fantastic friends at market and partnerships continue to grow for our little company. We are so thankful for all the opportunities afforded to us! 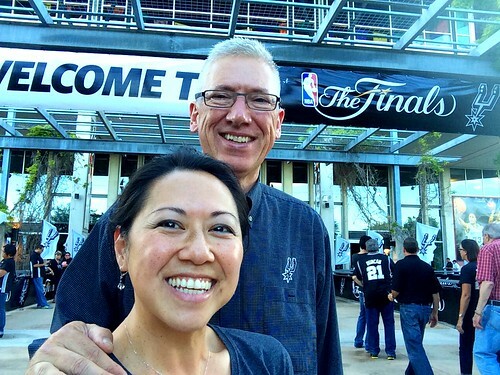 Finally, here’s another reason we got a little busier and more distracted – GO SPURS GO! Our marvelous Spurs made us so happy and proud. We are so thrilled we were able to go to different series games and got to see the final game and watch and be a part of the celebration at the arena. This team is amazing and we can’t wait to see what Tim Duncan’s 18th season will be like. Happy we get to see him another year at least! Besides church in the morning, Sundays are now a little extra time to catch up on tasks around the house (both personal and for GBR) as well as some much needed time to simply rest. We’re not quite the spring chickens we used to be and while we aren’t ready for retirement, we just needed at least one day at home. That doesn’t mean we sit around watching football like we used to while we read the paper. There are plenty of things to do to keep the business and the home running – we just get to go at a more leisurely pace and when we’re not feeling so great (me), we get to actually go back to bed for a while. I was thankful for the extra rest yesterday, that’s for sure. And I also FINALLY had and made time to move my trillion-billion pictures off my computer and onto external memory. Phew. 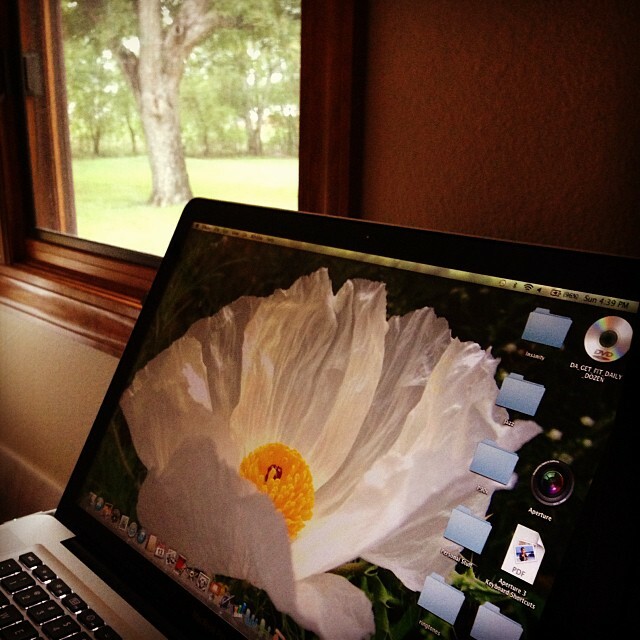 Been dreading that but now it’s done and my desktop and Mac are super clean and happy. Yay for time! 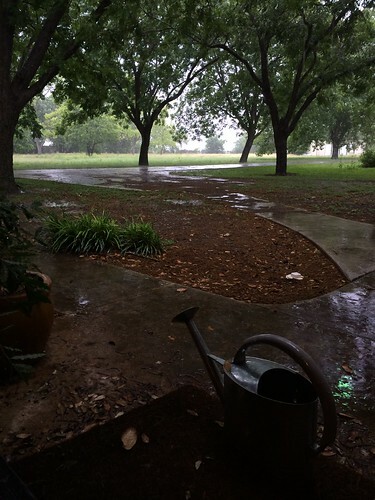 Anyway, in weather news – we got rain again! It started Saturday, overnight, and it’s been raining on and off through today. At lunchtime, I checked the radar and saw a line running north/south and moving across the area westward so I booked on home and got here in time to prep lunch and then we watched a strong rain shower come down on the Bee Ranch. The sound of it on the metal roof is quite lovely. 🙂 I think the rain gauge indicates about 4.5 inches of rain so far. 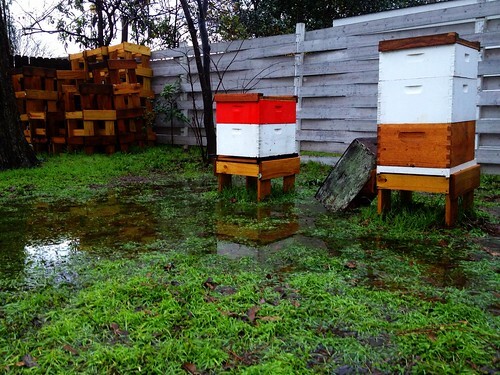 This nice, lingering, soaking type of rain is great for the parched ground and it’ll certainly help with next year’s flowering season, which will certainly help with honey production we anticipate. Already, this fall has been better than last year’s fall in terms of moisture. The weather people predict a bit more rain this week – pretty exciting news around here. 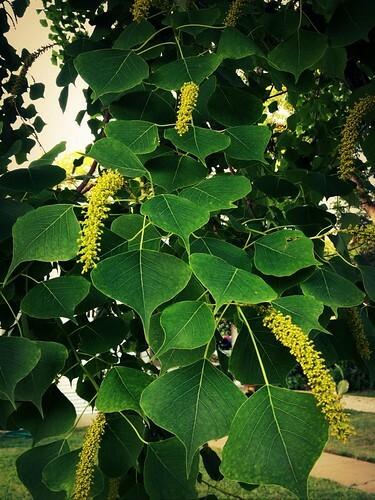 When we went out to collect pollen at Cibolo Creek yard, we saw the Bottle Brush fading but there was a bit of Bee Brush in bloom along with a variety of yellow wildflowers I haven’t looked up in our books yet. 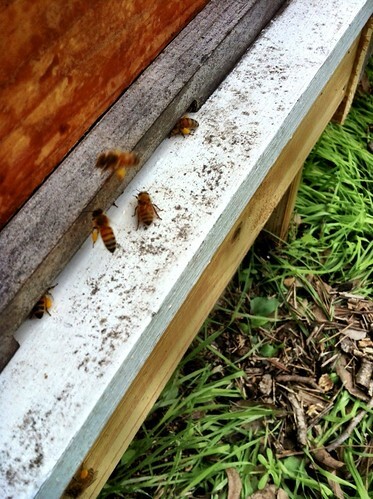 Pollen collection has gone well and the girls are quite productive. Mark has put away a decent amount of pollen for them and even made up several jars for people wanting pollen for allergy relief. I am thankful for it as well as my allergies have been quite manageable and only occasionally am I impacted by them. I am, however, very pleased that I can’t recall the last time I had an infection due to allergens. Yay! 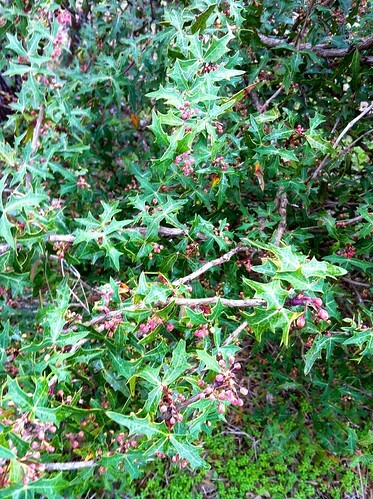 I used to get them several times a year once allergies entered my Texas life. Miserable, especially right about now with cedar, which I noticed just started appearing in the pollen reports I get emailed to me daily. Nerd, right? I like to know what’s in the air so I know what might be triggering any reactions. Anyway, I have put in my own order for some new pollen to ward off whatever this fall has in store for us. 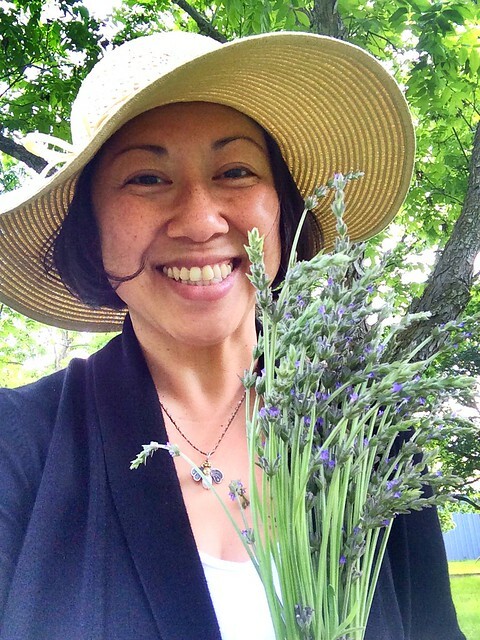 Yay for connections with the awesome beekeeper! 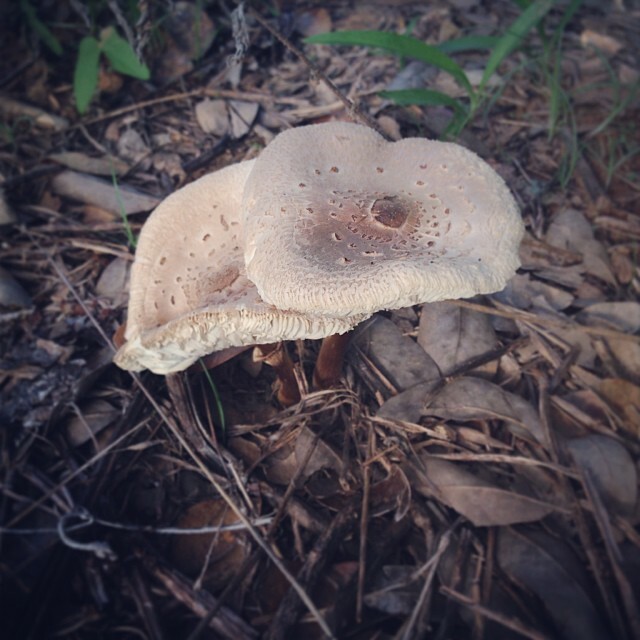 Check out these lovely mushrooms I spotted out at Big Oaks bee yard – really cool new things pop up when there’s actually rain! Ohhh! Sundays are also for visiting and being with family and friends. So, in light of that, we want to make it official – we’ve set the date for our 4th Annual Holiday Open House at the Bee Ranch! 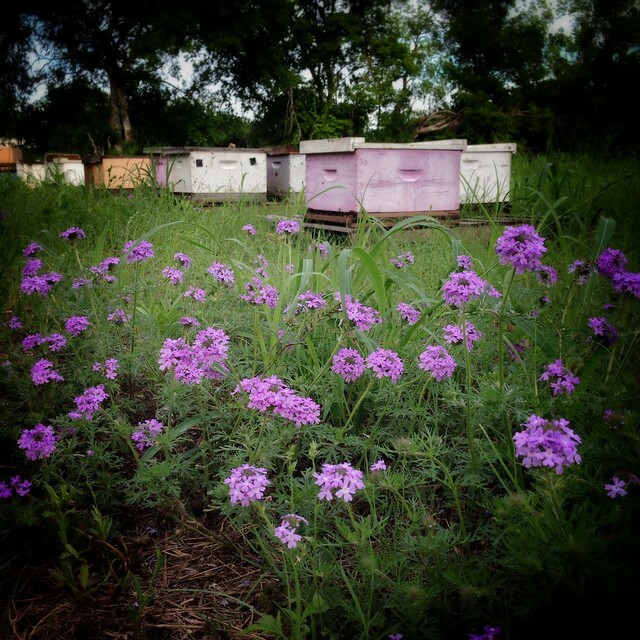 We hope you can join us here at our Bee Ranch on Sunday, December 8. Like last year, it will run from 2:00 p.m. to 6:00 p.m. and there will be light refreshments, bees (as long as conditions permit us to bring them here and they won’t be bothered by it), me and Mark giving visitors our time and attention, candle shop tours and hopefully demos (depending on what’s cooling in the molds), honey tastings and shopping, of course! We always have a lot of fun so we hope to see a lot of you here. 🙂 I’ll post more information as the date drawers nearer. The Spurs season is gearing up! You know we are crazy about our Spurs and especially about Tim Duncan (okay, I might be a little crazier about him than the beekeeper since TD’s an ACC guy). GO SPURS GO! Smokey and Mark teamed up and got a rattlesnake in the backyard, in case you don’t follow our other social media outlets. About 3 feet long and hopefully that was the mate to the earlier one we spotted and shot at months ago. eeks. The scorpions are out and about and I do not mean the band. We had two in the house this past week. Double eeks. Okay, I’ll call that a wrap for the night. 🙂 Just wanted to catch you up a bit on us. Y’all have a super great week! Don’t forget to enjoy life and have a little fun each day! Mark showed me his pictures from a visit to the Coyote bee yard this past week and I knew we should share a picture of the Agarita out there. I have yet to see them in bloom in person so he’s going to take me out there when these buds open fully. Can’t wait to see it and photograph it. Once the Agarita blooms near the beginning of March, the bees will mainly use the nectar in order to build up their hives and prepare themselves for spring and the wildflowers that will be in bloom. With the rain we have gotten lately, the wildflower season should be a great one and we are very excited to see how the flowers and bees do this year. It’s got to be better than anything we saw last year. When I got home from work today, I saw Mark in the Honey House so I headed back there. 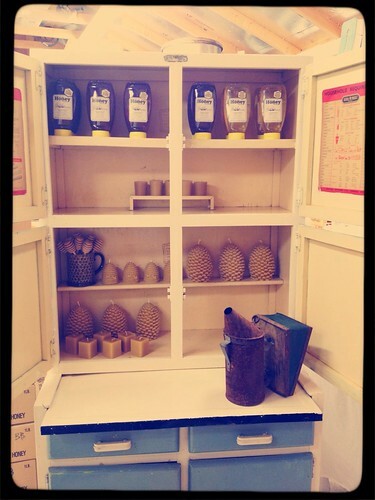 Friday evenings we clean up the Honey House and get materials and suits ready if we have class the next morning. We are anxious to see what develops as the forecasters are calling for storms, two inches of rain and flash flooding. Hmm…could prove tricky for us to have twenty-three students and a flooded back yard. Not a horrible problem to have and we aren’t complaining but we’re going to have to get creative! As I told Mark, we’ll roll with it and see if the rain actually comes. And then we’ll see if the students venture out. If they’re here, class is on. 🙂 Unless it’s such bad conditions that Mark actually cancels class. But we haven’t had to cancel any classes to date so we’ll just have to see what’s what in the daylight tomorrow. 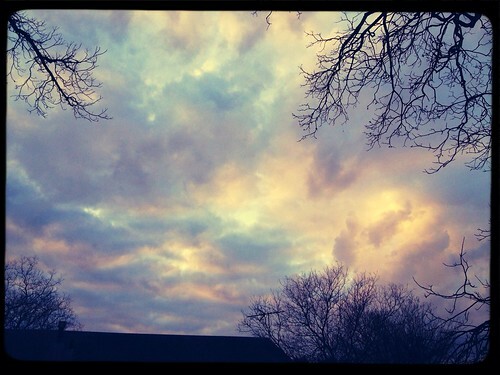 Meanwhile, I leave you with a shot of what I saw as I walked from the Honey House to the back door to go make dinner – isn’t that a lovely sky? Last night the soft rumble of thunder started around 9:30p. I could hear it once in a while as we sat in the living room. At first I thought I might have mistaken the sounds of a car rumbling by or something but I was hopeful since they did tell us there was an 80-90% chance of rain. They have, however, been known to be wrong. They being pretty much all the meteorologists. 🙂 Anyway, they were right and we had a fantastic storm packed with flashes of lighting (some soft, some glaringly bright in the night), thunder that ranged from soft rumbles to startling claps, a touch of wind (much more than a touch west of us in San Antonio), and several inches of precious rain. 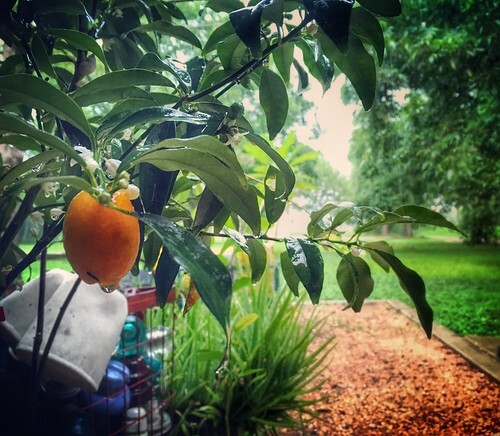 Our rain gauge showed a little more than two inches as I posted over on the Seguin blog. Other parts of the area reported a range from one to five inches. We are all happy to have the rain and it was exciting to drive to work this morning and see the gushing waters here and there. Awesome. You Know what else is awesome? The pollen the bees are carrying into the hives in the backyard. We have been seeing more and more brought in but besides the mustard growing wild, I’m not sure what else the bees are working right now. Over the weekend, we saw different colors of pollen, from red and yellow to bright red. It was so nice. 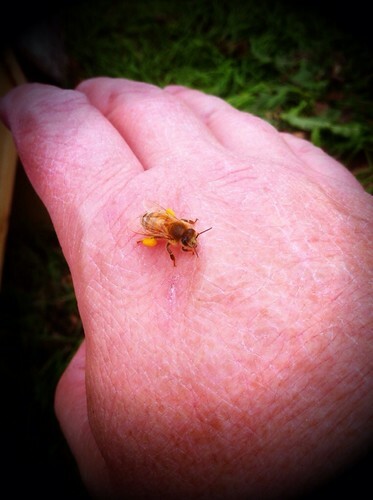 These first two shots are from Mark when he checked on the teaching hives we have here at the house. Things dried up nicely throughout the day and the sun peeked out here and there. It warmed up enough for the girls to get out and do their foraging thing. I love the shot he caught of one of the bees on his hand. I am always still fascinated by the pouches of pollen they carry on their little legs. What’s more amazing to see is when they deposit the pollen into a cell on the frame. It hits me how small an amount each pouch is and how many pouches it may take to fill up each cell. Then multiply that cell by how ever many are on one side of a frame. Then double that for the other side of the frame. Then multiply that by nine frames per box. Is it just me or do you also find that a bit staggering to think these tiny little bees work themselves to death literally, to accomplish this? Sometimes this sort of thing drifts through my thoughts as I watch them at work or look at pictures Mark has shared with me since I couldn’t be there with him and his girls. Here’s a shot of the bees this morning. I snapped some shots of them as Smokey and I checked out how much water was still standing on our lawn out back. I thought it looked so pretty. Everything is so green right now and this is so different from last year for sure. We haven’t seen puddles like this in two years I dare say. Yay for us and yay for the bees. Not to mention the wildflowers to come soon! 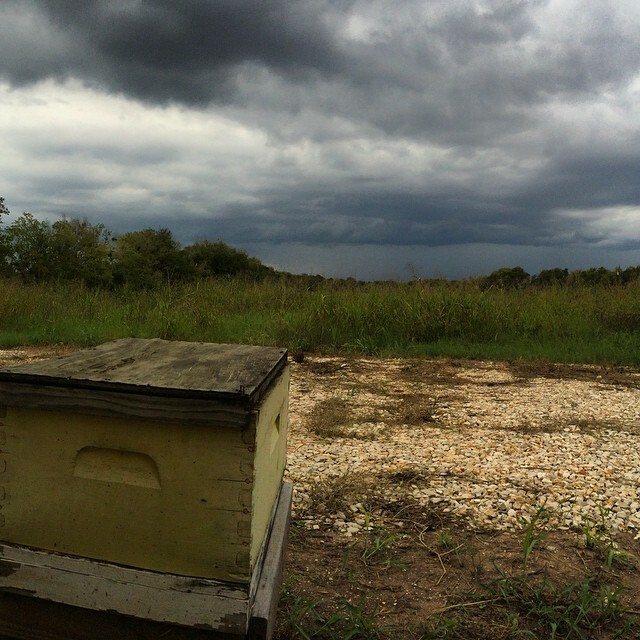 Can’t wait to see how the rain will impact the blooming season and then the honey harvest.